Loretta Lynch confirmation: Attorney General nominee ensnared in unrelated Senate fight over anti-trafficking bill and abortion. 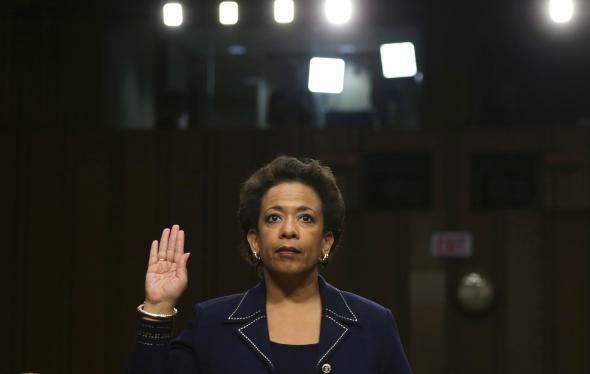 The GOP has found another reason to delay Loretta Lynch’s confirmation. Loretta Lynch has already waited 128 days for the Senate to vote on her confirmation to be attorney general. It appears she will have to wait at least a few more. Senate Majority Leader Mitch McConnell had suggested he’d finally bring Lynch’s nomination to the floor this week but unexpectedly reversed course on Sunday, saying that vote wouldn’t happen until the chamber resolved an unrelated fight over abortion funding that has derailed an otherwise uncontroversial anti-human-trafficking bill (and now, the Lynch confirmation). “I had hoped to turn to her next week, but if we can’t finish the trafficking bill, she will be put off again,” the Kentucky Republican said on CNN’s State of the Union. Democrats blame Republicans for circulating a legislative briefing that conveniently failed to mention the abortion provision, and Chairman Patrick Leahy claims he and the rest of the judiciary panel’s Democrats were “assured” it wasn’t in the bill. Republicans, meanwhile, say that wasn’t the case—and furthermore contend Democrats had plenty of chances to actually read the bill for themselves. Regardless of the dispute’s origins, though, it appears likely to derail a planned procedural vote on the bill tentatively set for Tuesday. Republicans would need at least six Democrats to break with their party to avoid a filibuster. Meanwhile, Lynch’s four-month-long-and-counting confirmation odyssey will continue. Eric Holder’s would-be replacement has faced a lengthy wait that has gone from unusually long to historically so. By the New York Times’ count, the last attorney general to have waited longer was Reagan nominee Edwin Meese III, whose confirmation dragged on for more than a year while the Justice Department investigated his professional and personal affairs. Assuming Lynch does eventually get a vote, she’s expected to win confirmation by the narrowest margin in AG history—and may even need Joe Biden to break a 50–50 tie, marking the first time that a vice president would cast a tie-breaker for a Cabinet confirmation in Senate history. GOP opposition to Lynch has come down to the single issue dominating Congress for much of this year: President Obama’s executive immigration action. While Lynch had nothing to do with the policy itself, she angered Republicans during her confirmation hearing by saying she believed the actions were constitutional. (As Roll Call’s David Hawkings accurately points out, in more rational times, it would have hardly been newsworthy for an AG nominee to side with the president who nominated her.) Meanwhile, Republicans have had noticeable trouble finding anyone to say anything bad about Lynch as a person or an attorney. But for this week—like the 18 that came before it—that does not appear to matter.